THE PRESIDENT of the National Union of Students in the UK has distanced his union from the actions of anarchist protesters after riots broke out following a student march in London this afternoon. In scenes bizarrely similar to those of last week’s protest in Dublin – in which riot police were deployed after a march against increased registration fees – violence broke out after 52,000 students had demonstrated against government proposals to raise university tuition fees from £3,290 to £9,000 a year. After the march, which had largely gone off peacefully, a significant quantity of students – though still a minority of the total turnout – swarmed on the Millbank Tower, currently used by the Conservative Party as its headquarters, smashing its front windows and staging a brief sit-in before starting a fire in the building’s lobby. Other students scaled the tower to its top, and waved anarchist flags from the summit of the 30-floor building. Protesters explained that they were occupying the building in order to demonstrate against “the Tory system of attacking the poor”. Eight people are reported to have been hospitalised. The NUS itself, meanwhile, has threatened to mobilise its members to use the right of recall and unseat any Liberal Democrat MP who votes in favour of the government proposal. Email “Sound familiar? Student protest in London turns nasty”. Feedback on “Sound familiar? 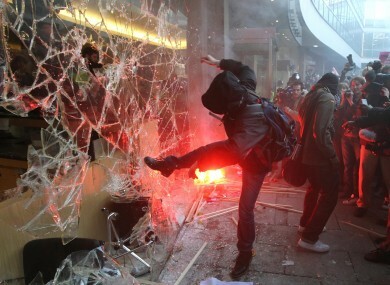 Student protest in London turns nasty”.